You can now allow yourself to express your power. Being powerful is safe for you, knowing that you can express your power with love! The Creator is with you and you have all of the power of the Universe behind you. Use your Divine power of love, wisdom, and intelligence and tap into the Universal wisdom of the One Mind. The angels ask you to give them any fears you may have connected with being a powerful person. Your angels see a quiet and beautiful aspect of your true power, stemming from the One Power…The Universe. Allow yourself to shine with the radiant love so that your true power can radiate out into the world in miraculous ways. You are moving into a time of greater inner peace & tranquility. Peace of mind means feeling secure and knowing that you’re always provided for. Even if your logical mind can’t fathom how a challenge could be resolved…peace of mind means that you trust that The Universe will create a miraculous solution! Remember that faith is always warranted because faith is a key component in experiencing miracles. By drawing this card the angels reassure you that peace of mind is within you. Feel the serenity in the midst of turmoil. It is a mistake to think that you have to wait until your life is problem free before you can be happy. The opposite is true. You must first be happy & serene and then your life challenges will lessen and disappear! Serenity is your natural state of mind and the angels are help you now to realize this. You are a perfect child of God and every part of you is wonderful! Let go of negative self judgment and enjoy being you! You are much too hard on yourself and the angel are saying that to you through this card. Although you enjoy having high standards it is important to view yourself through loving eyes. Stop berating yourself…it only makes your spirit sink. Self improvement comes from a positive mindset! See yourself through the angel’s eyes. You are a perfect child & a hold child of God. Don’t worry if you’ve made mistakes in the past. (Who hasn’t) There is nothing that you could have said or done that will ever change how perfect you are in the eyes of God or the angels! They love you unconditionally and they ask you to love yourself in the same way! What an awesome reading guys! This week is all about being the most powerful, loving & serene you possible! It is about being the loving authentic you that you are and to realize that you are loved and cherished!!! Stop beating yourself up and go forward with faith! Ask the angels to show you! They are here to serve, help and heal us! We are here to learn and discover the contrast between the light and the shadow. To realize how beautiful we really are and to speak your truth in a loving way to others. Also…you have been praying for a miracle. It could be a new job, a raise, more money, or just a break to show how fabulous you are! Guess what the time is NOW!!! Expect a miracle to be coming to you soon! Don’t stop with your forward momentum on this!!! Keep pushing! You are almost there!!! Have faith that the angels are behind you with that extra nudge that you need in just the right time! Intuition baby…INTUITION! Live in the moment!!! A wise old cowboy once told me, “If you have one foot in the past and one foot in the future…you piss all over your present.” LOL It is so true. To live your life you must be present! So stop all your woulda, coulda, shoulda’s and enjoy the moments that matter here and now!!!! I guess this is all about getting Tuned In Tapped In And Turned On! The only time that matters is now! So stop beating yourself up on things or events that you “think” you missed. Remember that life is like a carrousel and the next chance or event is coming round the next turn. You’ve got this!!!! Remember that you are powerful!!!! HELLO!!!! Sometimes in order to get to this place we need to tell ourselves how wonderful we are and be grateful for everything that we have and have accomplished! So find a few moments to be alone (You deserve it) and just be quiet. Breathe!!! Do it deeply and with purpose. Be silent and listen to your inner voice. That is your spirit and the angels guiding and loving you! They will always guide you to the path you desire. Trust your intuition! That’s your spirit! Meditation is a great way to get to this place. Love on yourself…do things that make you happy! You are a powerful manifesting machine and the time is NOW to set the ground work for a well balanced abundant life that you deserve and the angels want to help you to achieve…just ask them and they will!!!! 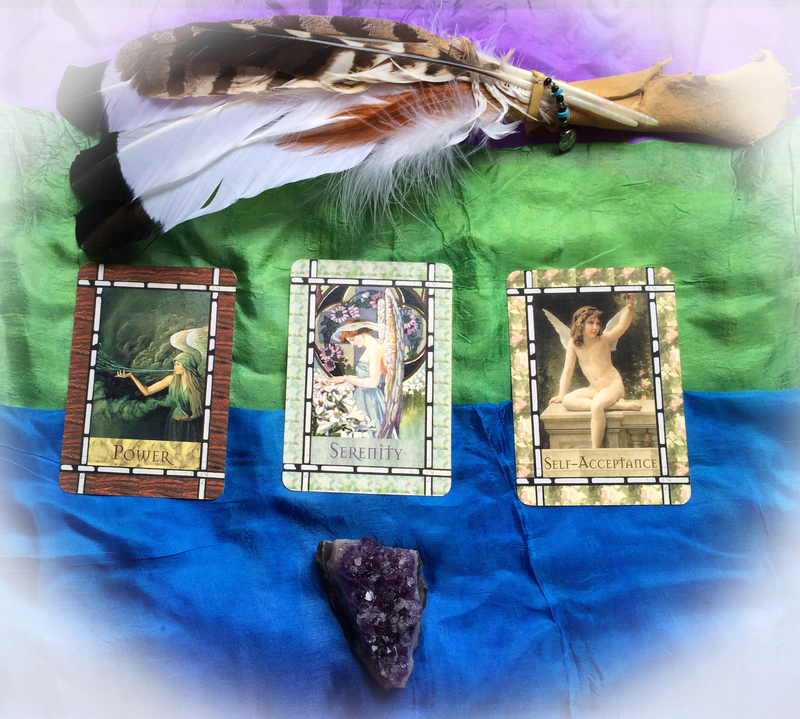 Hope you enjoyed your weekly Oracle Card Reading! If this is something that you would love for me to do every week please let me know! For a more personal reading…please contact me! I am also now recording the reading so that you can go back and listen to them again. Thanks for all your love, light and laughter! I am grateful and absolutely inspired!!! You are awesome!!!! Please like, share, follow my blog! Tell your friends and family! PS…I am doing all payments through PayPal. I am still under-construction so this part of the page to schedule will be on my website soon. But don’t let that stop you from contacting me…I can always do readings! Have PayPal will travel!!! LOL! Love you!